It’s Almost Time for the Prom. 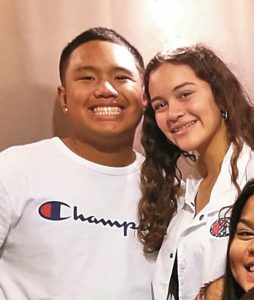 Jigger Sablay will bring his girlfriend, Maria Rodriguez to the 2019 Maui High School Junior Prom. It’s that time of the year when Juniors are preparing for the big ACT Test. February is the month of procrastination and stress. As a reward of hard work, Junior Prom is around the corner. This year’s Maui High School Junior prom will be held in Lahaina at the Hyatt Regency Maui Ballroom on April 20, 2019. The registration for the prom costs $80 per person, so it is not cheap but there are ways to earn that $80. You can recycle cans and bottles and sell it, or if you want the easy way, just ask your grandma or grandpa. You only live once so this is a night that Junior students do not want to miss. In this prom, there will be nominees and two lucky people will be selected as this year’s Prom King and Queen. They will vote and it will be announced at the prom. 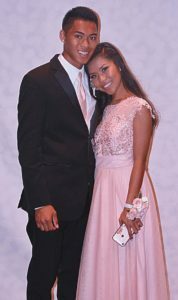 Allen Surbida and Rose Anne Rafael at the 2017 Maui High School Junior Prom. 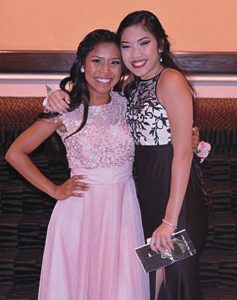 “It’s the best time of high school, prom means fun,” says Maui High School student Jigger Sablay. He plans on taking his girlfriend, Maria Rodriguez to the 2019 Junior Prom. He didn’t ask her yet because his procrastination kicked in. He is confident that she will go to the prom with him. How does a Junior prepare for prom? Jigger will prepare by getting a new haircut so he can look sharp for any photoshoot with his special someone. Jigger plans on bringing his phone and camera to prom. He will use it to take pictures of him and his friends to record this epic night of fun. To him, the pressures of preparations for prom is being late. He plans on leaving two hours early from Kahului so it will give him a lot of time before the prom to beat the traffic or rush hour going to Lahaina. After prom, he plans on spending time with Maria to get to know her more. Unlike Jigger, another student, who wants to remain anonymous, is taking a completely different approach to his Junior prom night. He will wait for the girl to ask him to the prom. He will borrow his cousin’s tuxedo and they will share a ride with his friend and his date. He looks forward for the great food at the Hyatt as well as the dancing part of the prom. He loves food and dancing. There are these five ladies, who are friends since Elementary school and are determined to go to the prom, with or without dates. One said that if no one will ask them to the prom, they will be each other’s dates. They are so excited that they already ordered their gowns and booked their make-up appointments. They would like to be dropped off and picked up in a limousine. They encouraged all the Junior students to go to the prom. If they don’t have a date, just ask their best friend or any of their friends and form a group like them. “Let’s go to the prom to have an experience and memories that we can share when we are old. We should enjoy our high school days because it will never be the same as college. I know this because I have two older siblings who talk about what they did and how much fun was high school and how they don’t have time to have fun now that they are in college,” says one of the ladies. 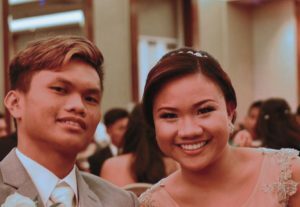 Cousins Bryant Tabujara and Cortney Tabujara at the 2017 Maui High School Junior Prom. 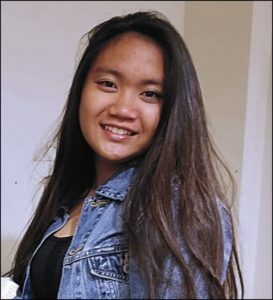 This month’s guest columnist is Keilah Elizabeth Galiza, a freshman at Maui High School, who is part of Maui High’s Business Core and AVID program. She is also a member of the Maui High School Marching Band (playing the clarinet) and is excited about the band’s future trips. In her spare time, Keilah likes to read books and watch horror movies and Korean dramas. She aspires to become an entrepreneur one day. Keilah is the daughter of Dulce Karen Butay of Kahului.